Posted: Mon 19 Dec, 2011 3:49 am Post subject: Images of late 15th/early 16th C scabbard details? 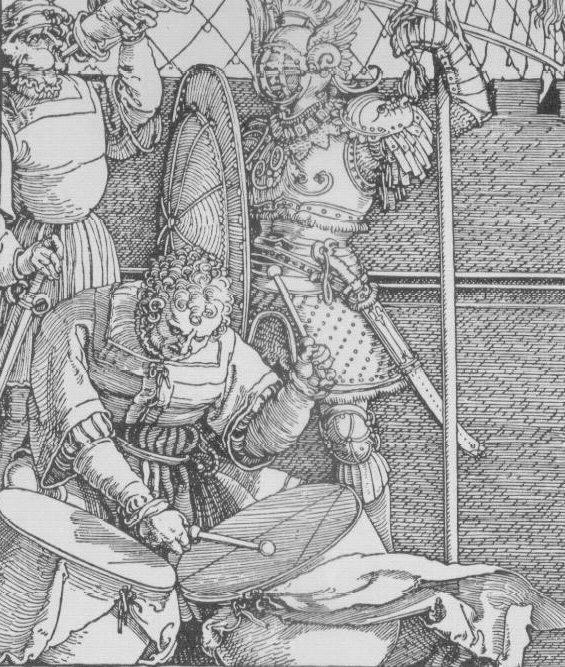 I have the great good fortune of having a slot soon in Brian Kunz's scabbard schedule, for not one but two Albions - an Earl and a Munich - and am looking for period examples of late 15th / early 16th C scabbard design details for inspiration. 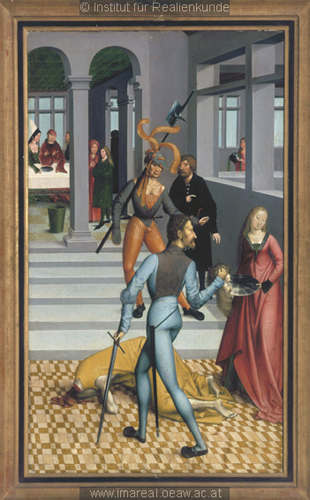 Now, before someone says 'we have lots of threads on scabbards here', I'm after images of actual scabbards, or images in period art, that show the detail of design: tooling, risers, chapes, and so on. I've looked at many threads here, but couldn't find many images that show these details. We do have some great images of messer scabbards, such as the 'messer scabbard pictures?' thread, and the Knecht thread ... these images have more detail of scabbard design than most that I've seen here for longsword scabbards. To me, this fairly lineal design is an interesting contrast to the more sinuous designs that Brian is fond of (and so very good at), and which are mirrored in the scabbard at the end of the row that contains the Bayerishces, below. 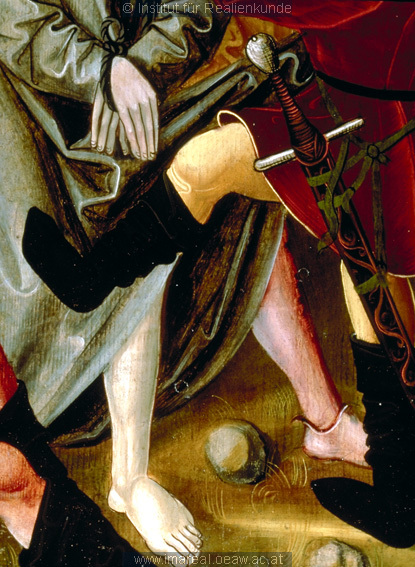 - Do you have any images that show good detail of late 15th / early 16th C scabbards - risers, tooling, chapes? - Colours: Peter Johnsson let me know that the grip and scabbard colour on the original Bayerisches was a very dark brown. Mine is now black; do we have images of black grips with brown scabbards? 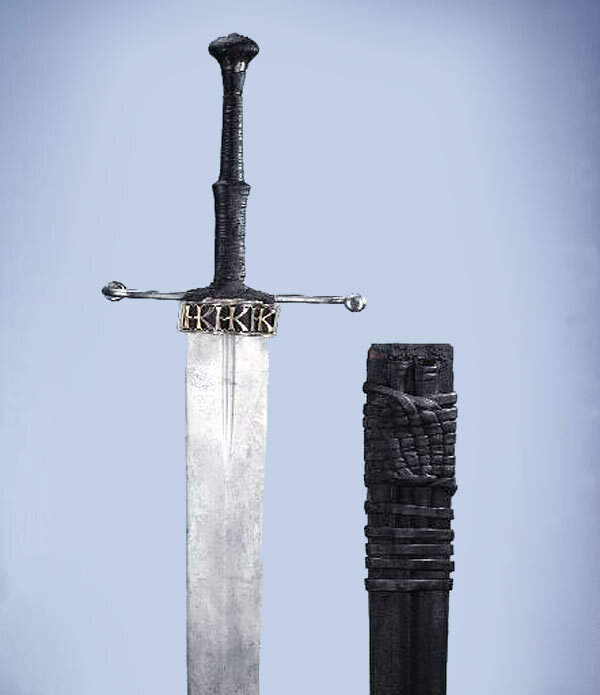 Alternatively, my Earl's grip is oxblood; sinuous lines seem to work best on scabbards Brian has done in various shades of brown ... do we have examples of an oxblood grip and brown scabbard in period art? Would it look odd? On the other hand, would sinous lines work on an oxblood, or black, scabbard? 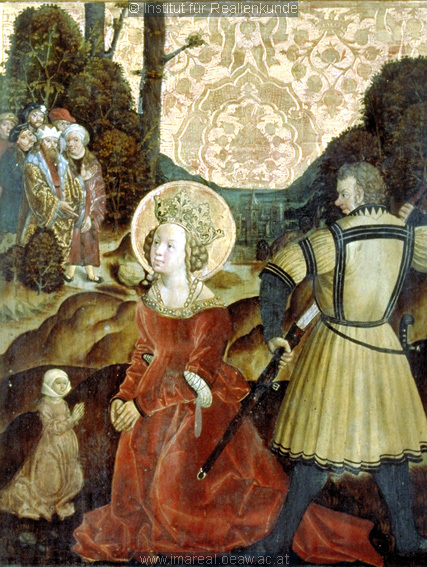 Here's the right panel of Dürer's Paumgartner Altarpiece - this one clearly shows a longitudinal riser. However, more interestingly, what can look like a 'rainguard'/chappe in most versions looks at this resolution like it could be a double-wrap of leather straps ... possibly with buckles. 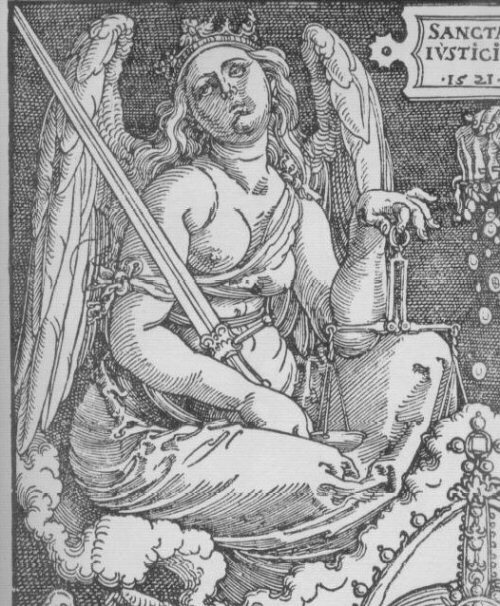 Dürer's Die vier Windengel und die Versiegelung der Auserwählten (1497/98) also clearly shows risers. 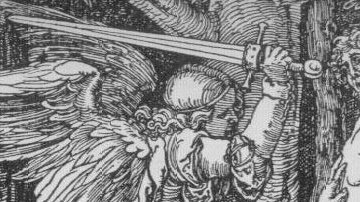 The image below loses a critical detail of the original - the longitudinal riser is shown in both swords as having a dedicated thickness. (This means there's no confusion about it instead simply being a line caused by a change in plane of the scabbard's diamond cross-section.) 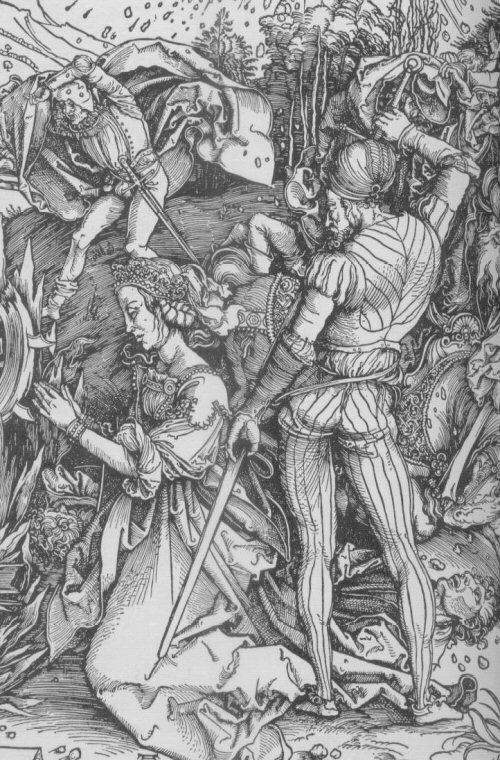 This detail can be more clearly seen in the reproduction in Albrecht Dürer: Waffen und Rüstungen, Heinrich Müller (Berlin, Destschen Historischen Museum, 2002). Here's a fantastic image from Tod's sword scabbard for Toby Capwell thread. While the scabbard itself doesn't have much detail, the two notable things is that a) it's bright orange, and b) the 'rainguard'/chappe is black. This is great to see, as some other images showing chappes just have them as the same colour as the scabbard itself, but chappes of a different colour can look very distinct and striking (such as this one I had comissioned a while ago). 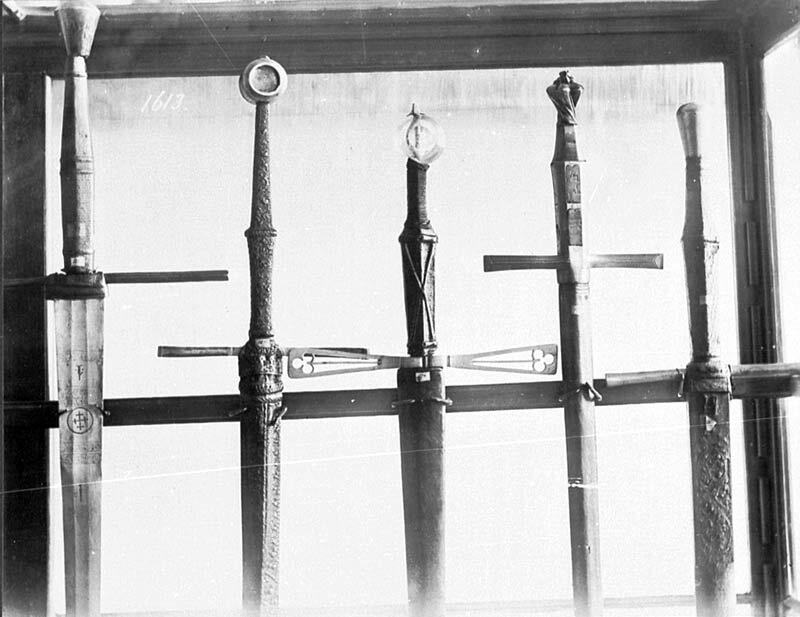 This image suggests the scabbard faces were plain, as other items show a lot of detailed work. 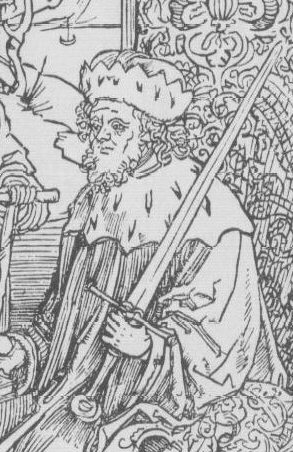 I finally also just found Julien M's Ornamented scabbards - pre 16th century thread ... but that covers a longer time period, and is focussed specifically on ornamentation. I'm interested in a more limited period - late 15th to early 16th C - and scabbard design more generally: colours, chapes, chappes, risers, tooling, shapes, and so on. Anyone have other images to add? 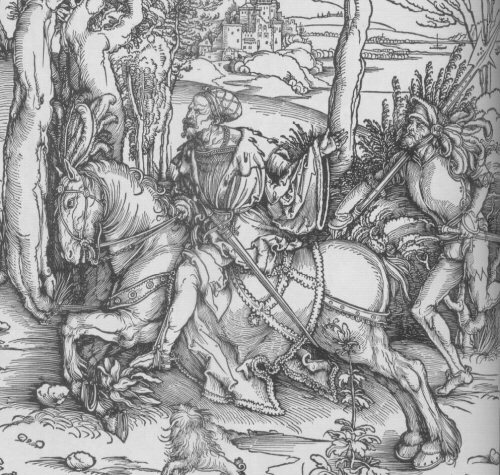 i have an entire book with Albrecht Durer's wood cut prints, and that man left out very little detail in his work, though his 's' and ovals look a little flat on the quillons in a lot of his work but it shows the great variety of leather work through his era. it would take me some time to get the titles of all the works that i have in the book that reference leather work. there's easily over a hundred. the more popular wood cuts i see have already been posted. Hi Daniel, if you get time to post some of the less-common images, I'd love to see them! This scabbard shows a diamond-section scabbard, with clear change of plane in the faces, rather than the use of a longitudinal riser. It also has two horizontal risers in bands just below the 'rainguard' / chappe. s johns vision of christ and the seven candel sticks. ok i just have two more. ok Mark that's the best ones i could come up with for you, other images are so small that it's hard to tell what your looking at. 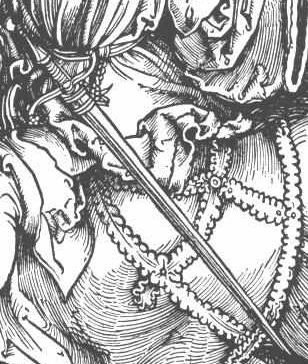 all i can stress is that durer drew from experience and things that he saw, but without the application of color some of the images are hard to tell where the guard begins and the suspension for the sword. one thing of note that i have noticed is that in some images he does show rain guards on longswords where the guard is also covering byknives. now that does seem pretty reasonable because if your guarding your primary blade from the weather why not include your byknives as well. the risers as well i can only speculate if they are actually leather or a metal material in some of these images. 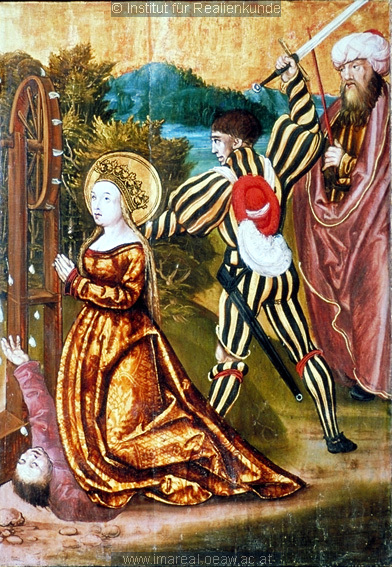 due to the lack of 'cross thatching' on these depictions which would give the illusion of texture, it's a better chance that they were made of metal. others seem to be tooled leather but i find it interesting that most of the risers are depicted snugly up against the primary hand and not in the center of the handel. we can look over the images and all give our input i know that the way i look at the work may not be exact to someone with more experience with leather work - that person may see another aspect that i'm over looking. 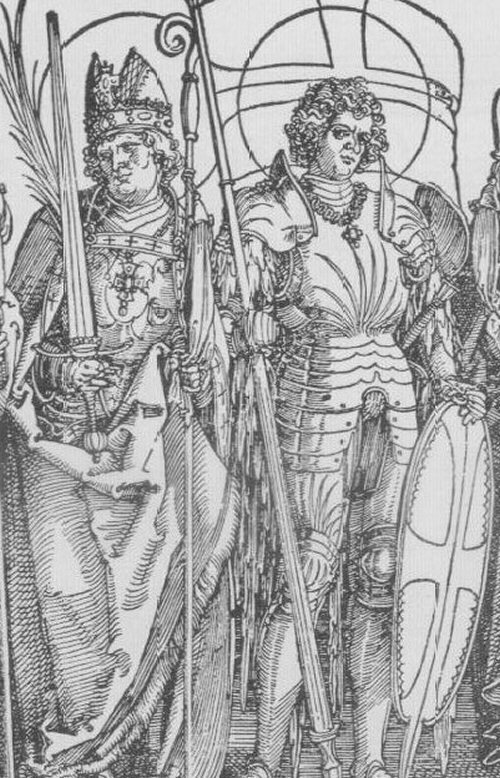 Here's the detail from Dürer's 'Ritter und Landsknecht' (1496/97), showing what appears to be a small chappe, suspension attachments high up near the throat, a longitudinal riser (or at least diamond cross-section), and the same very long chape, as seen in 'Knight, Death, and the Devil'. So, so far for the custom scabbards that Brian at DBK is making, it sounds like longitudinal risers and very long chapes would be a good choice. We have two examples of chevron/herringbone detailing/tooling, and a few of sinuous lines, so one of each sounds like the go. Any other period scabbard images? Any other suggestions for this commission? 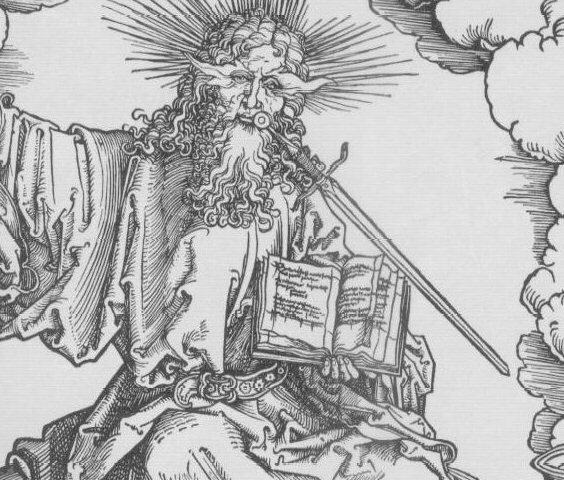 Here's one more Dürer that has a bit of scabbard detail, 'Fectende Reiter' (1489) - note again the very long chape. i'm really surprised with the diversity of rain guard designs. 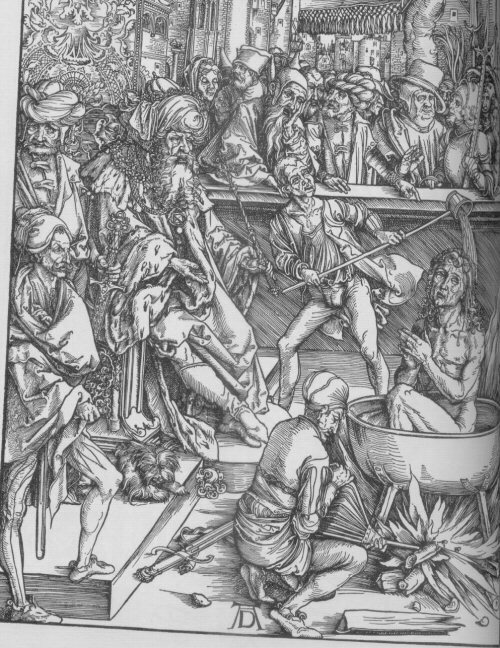 before studying durer's work i though they were simple and basic. Brian is a great artist he's posted his work all over here, when you come up with your final design i hope you challenge him! The recent site crash saw some images lost from this thread which helped justify its spotlight topic status! Will try to re-find and post here. Most of these have already appeared on myA; I'm including them here for the sake of completeness. 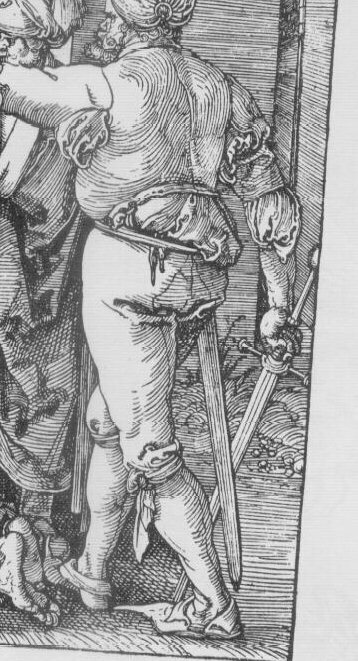 The more detailed images I see of late 15th/early 16th C scabbards, the more I'm convinced of Sean's point that many, if not most, of the scabbards from this time are fairly plain - at least in the leather finishing. 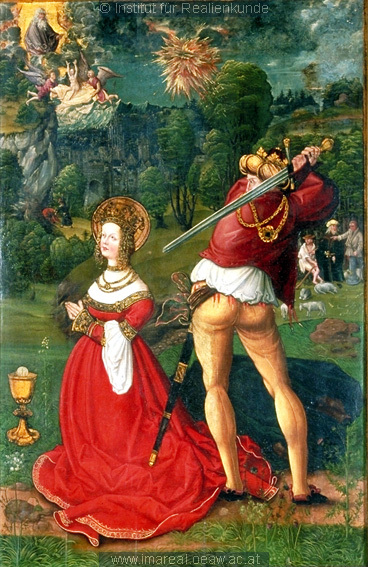 Finding images that clearly show us enough detail to show that the scabbards were plain can have some challenges, but they do exist; I'd be happy for them to be included here. Shows a rounded chape, which is less common on later-period scabbards. 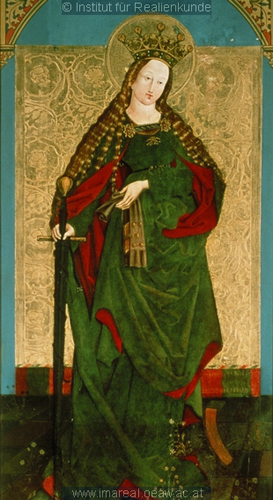 Also shows a strong medial riser, and possibly risers at the edge of the scabbard, similar to some Durer images.